Economic growth eased in the second quarter from the pace set in the first three months of the year, fueling concerns the fragile economy could slide into a double-dip recession. Despite the cautionary signals raised by the weakening headline number, the underlying components of gross domestic product (GDP) demonstrate that the economy continues to expand as growth spreads to additional sectors. For the first time since 2005, all of the major components of GDP, with the exception of imports, which always subtracts from growth, moved into positive territory, suggesting the recovery is becoming increasingly broad-based. The elevated level of imports, rather than stifled demand, was the primary contributor to the slowing pace of economic expansion in the second quarter, and rising imports reiterate strengthening consumption. 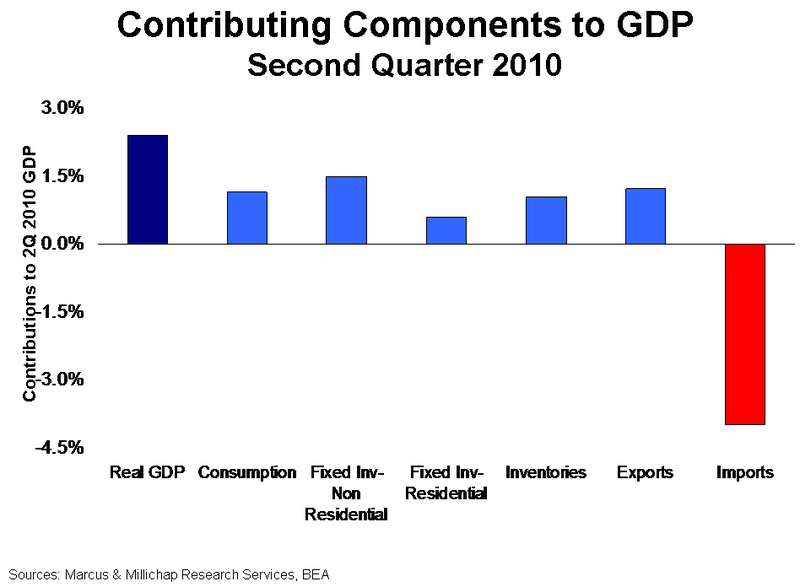 During the second quarter, GDP expanded at a 2.4 percent annualized pace, down from a 3.7 percent gain in the preceding period. Business spending drove growth, rising 17 percent, following a 7.8 percent advance in the first quarter. Thus far in the recovery cycle, business investment has been directed primarily to rebuilding depleted inventories and making technology upgrades, rather than hiring. Private businesses expanded inventories by $75.7 billion in the second quarter, up more than 70 percent from the first quarter. Private-sector employment growth remains modest, however, ticking up just 0.6 percent year to date. Instead, businesses met renewed demand by adding temporary workers; these positions account for nearly one-third of all nongovernment employment gains so far this year. Corporate profits, which rose more than 45 percent annually through the first quarter, and elevated cash reserves will support further spending in the second half, but more significant economic growth will not occur until firms begin to add more permanent workers to payrolls. Personal consumption, by far the largest component of GDP, rose just 1.6 percent in the second quarter, following 1.9 percent growth in the previous quarter. The increase came despite high unemployment, volatility in the equity markets and still-soft housing conditions. While spending growth contributed to GDP gains, personal consumption lags previous recoveries by more than 50 percent, hindering the rate of economic expansion. This trend will continue through the second half as consumers rebuild personal balance sheets by increasing savings. The personal savings rate jumped to 6.2 percent in the second quarter, up from 5.5 percent in the first quarter and nearly three times as high as in the period immediately preceding the recession. It remains to be seen if the increased savings rate marks a long-term shift in consumer behavior or will lead to the release of pent-up demand later in the recovery. A recovery in the apartment sector began to take shape in the second quarter and will continue. Vacancy declined for the first time in three years during the spring period, falling 20 basis points to 7.8 percent. Improvement was widespread, as more than 80 percent of major markets recorded vacancy decreases and effective rent gains. Rebounding fundamentals will continue in the second half as job growth persists and renters who doubled up during the recession return to the market; by year end, vacancy will drop to 7.4 percent, and asking and effective rents will increase 2 percent and 3 percent, respectively. Although the increasing trade deficit hampered GDP expansion, accelerating international trade will support the industrial market as goods are transported and stored in warehouses. Imports spiked 28.8 percent in the second quarter, while exports rose 10.3 percent, building on an 11.4 percent jump in the first quarter. Double-digit growth rates for international trade underpinned positive absorption of more than 3 million square feet of industrial space in the second quarter. Another 4 million square feet of net absorption will occur in the second half. Still, completions will slightly outpace space demand, and vacancy will tick up 10 basis points during the final six months of the year to 13 percent. This entry was written by marcusmillichap, posted on August 3, 2010 at 8:25 pm, filed under Research and tagged Gross Domestic Product. Bookmark the permalink. Follow any comments here with the RSS feed for this post. Trackbacks are closed, but you can post a comment.